JPMorgan has upgraded shares of rare earth specialist Molycorp, and raised its price target from $36 to $65. Analyst Michael F. Gambardella cites the company’s fundraising and decision to double its capacity, along with higher prices. 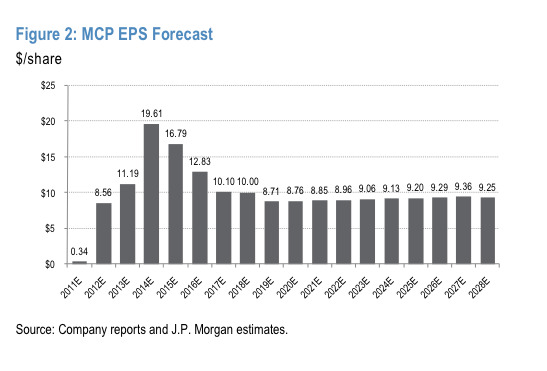 Because Molycorp has one mine site, JPM is confident it can basically model out the life of the company. Basically the company has a few gravy years coming out, and then a steady stream of predictable profits. 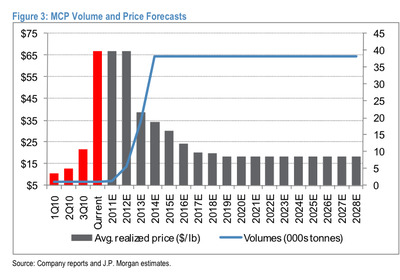 But even beyond the company, the pricing of rare earths looks similar. A few really big years, and then a price collapse once more mines come online. That rare earth prices will collapse in the coming years shouldn’t be too much of a surprise. Remember, rare earths aren’t all that rare. Thanks to environmental restrictions and lack of investment (coupled with China’s export restriction threats) prices have shot up. But once the investment has been made, there’s plenty out there to mine.